As a nonprofit organization, we rely on the generosity of our community to provide the support necessary to give our patients the best care they deserve. You can increase the impact of your gift by utilizing workplace or matching gift programs. Contact your employer’s human resources office to find out if you can support Virginia Mason via payroll deductions. 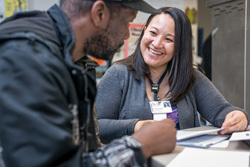 Your company may also match your cash donations and the volunteer hours you work at Virginia Mason, Bailey-Boushay House or the Benaroya Research Institute. Be sure to ask your employer and check out the list of companies with matching gift programs. Check to see if your company matches gifts: (206) 583-6083.